The above info came from yours truly. The image came from Amazon.com. 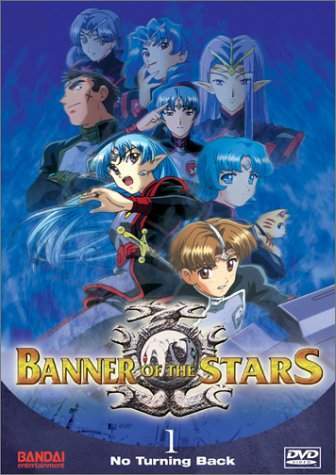 Banner of the Stars is a direct continuation of Bandai's Seikai no Monsho/Crest of the Stars, with the same cast, same plot, and same feel, so if you haven't seen Crest, Banner's going to get confusing. In the year 955 of...some calendar, the empire of the Abh, a blue-skinned race of genetically engineered humans, are at war with the non-genetically engineered humans, led by the United Mankind Empire. The story centers around Lafiel, an imperial princess, heir to the throne, and captain of a small warship called the Basroil (busy gal), and her supply officer Jinto. Y'see, in Crest the two met and nearly died a bunch of times while escaping the Abh Empire's enemies. Oh yeah, and they managed to fall in love along the way too. So, can love flourish between a gal who's bluer than the ocean and a guy whose home world is in the hands of the enemies? While set against the backdrop of a galactic conflict? Watch and see. Based on the books by Hiroyuki Morioka, Banner's got GREAT writing and clean, crisp art. The only slight knocks I have about the series are that because it's character driven and not action (i.e., space battle) driven, it drags a bit at times. The only other problem is that I don't think you could view this series more than once, so that brings down the score a bit. Solid Gold stuff though otherwise. And now for some background. As long as man existed, he's always wanted someone else to do the dirty work for him. And in this series, that "Someone else" was the Abh. So, as humankind expanded into space, the Abh were engineered to serve in hazardous duties in space without getting hazardous duty pay. Think of them as disposable people. Needless to say, the Abh didn't like that much. So they rebelled and built a world-spanning empire to ensure their own survival with a fleet of warships that would make any villain with megalomaniacal dreams drool. Anywhoo, this empire's gotten so big that the remainder of natural-born humanity's (the Abhs don't reproduce the normal way, bleh) pretty darn nervous about paying homage to an empress the color of a Crayola crayon, so they decide to deal with the Abh... permanently. The Abh were only too happy too oblige, so now both sides are locked in a battle that will decide the fate of mankind for once and all after a three-year truce. You'd think that with such grand themes going on, the characters would have a huge role to play in the coming rumble. Especially since Lafiel's supposed to inherit the Abh throne. Instead, she and Jinto are stuck on one of the smallest, more vulnerable ships in the Abh fleet and are in the vanguard of the attack. Not really a recipe for a long, prosperous life. Okay, anyone just get the Star Trek reference? The above description came from Totidem Verbis, and was edited by yours truly (contact me).